This post is sponsored by Overstock; however, all thoughts and opinions are my own. I am speechless. And for those of you that know me well, that is almost impossible! This is our boy’s bedroom. I never imagined it would ever look this good. 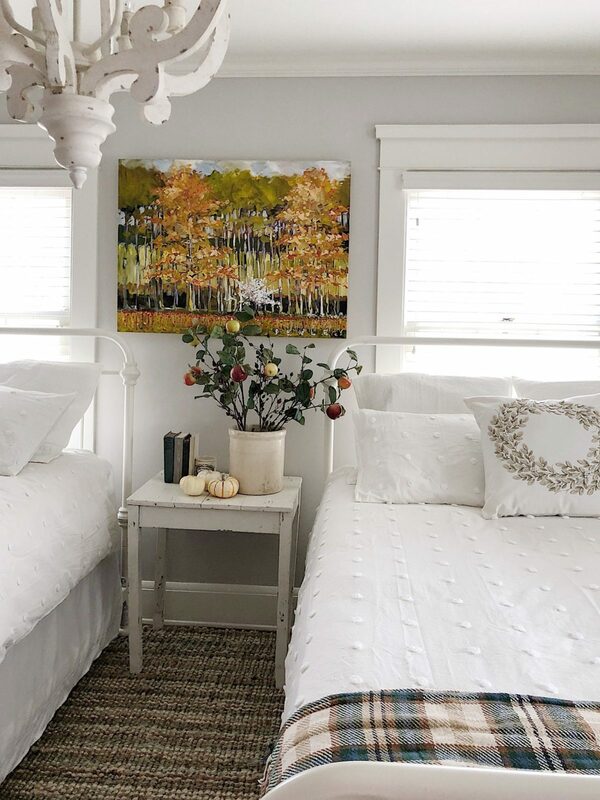 I am so honored to have partnered with Overstock to redo their room. It’s a very dramatic transformation and I am so thrilled with how it turned out. 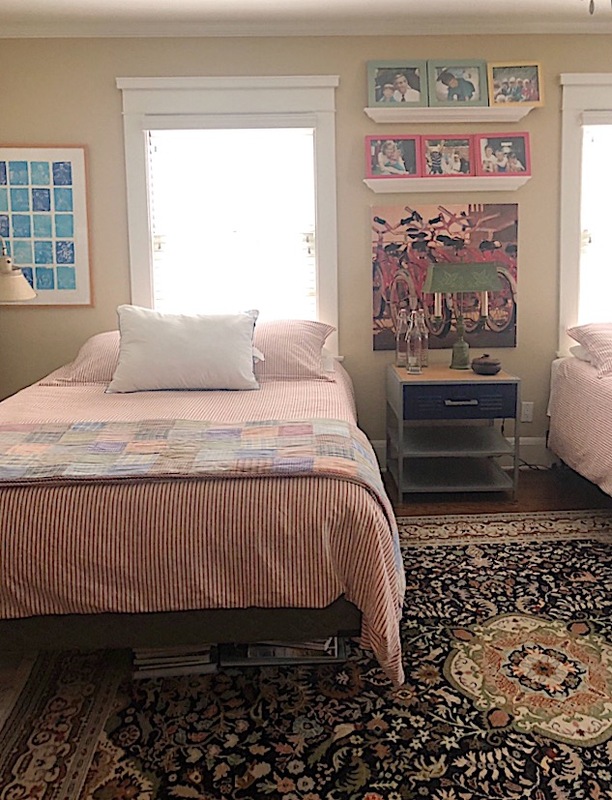 The room was almost entirely redone with furnishings from Overstock which included a new rug, beds, mattresses, bedding, a chandelier, and accessories. 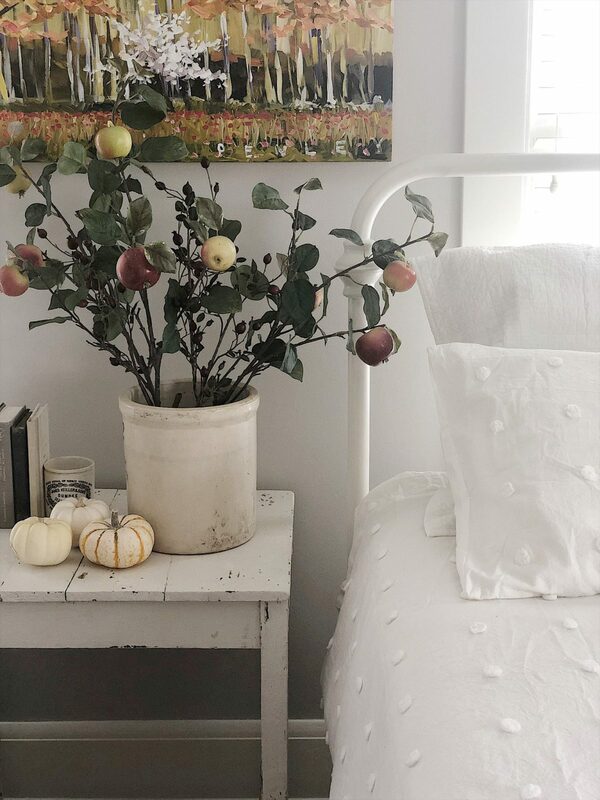 And I stlyled the bedroom for fall, which I love. It’s as if the bedroom grew up, just like our boys. 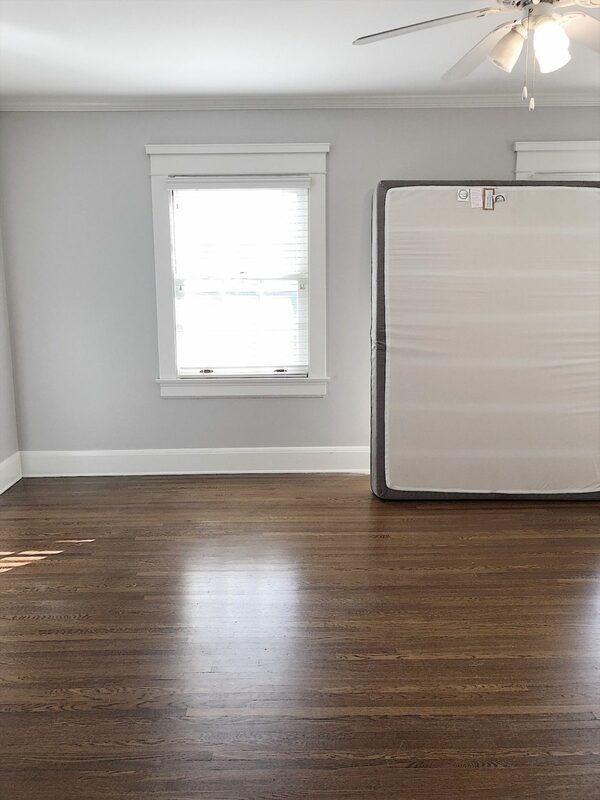 To appreciate this room, you really need to see the before. And yes, this room looked like this “before” photo less than a month ago. I had no idea how dramatic new beds would be in this room! 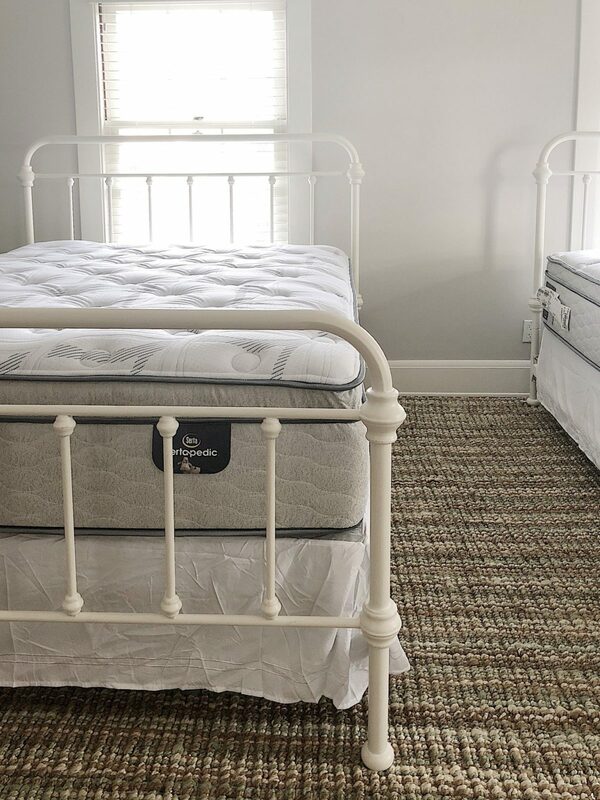 These are both queen sized beds and they look fabulous with the Serta Westview Super Pillow Top Queen-size Mattress Set. The mattress sets come in Plush and Firm and I ordered the Firm. I slept in one of the beds this week just to test them out and wow! It has a soft pillow top but a firm mattress. 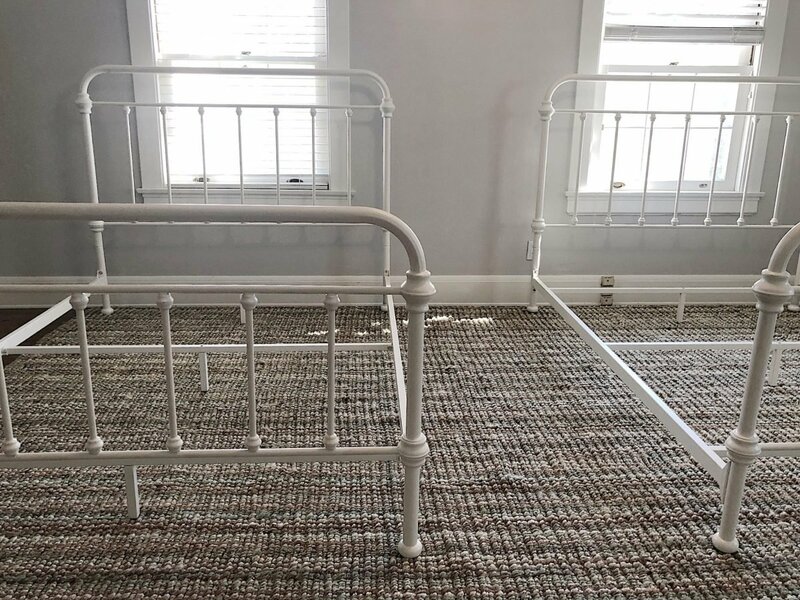 It’s exactly what every bed needs. I also love the height of the foundation and the mattress. This rug is so perfect for this room! The rug is the Safavieh Casual Natural Fiber Chunky Thick Handmade Sage/ Natural Jute Rug – 10′ x 14′. 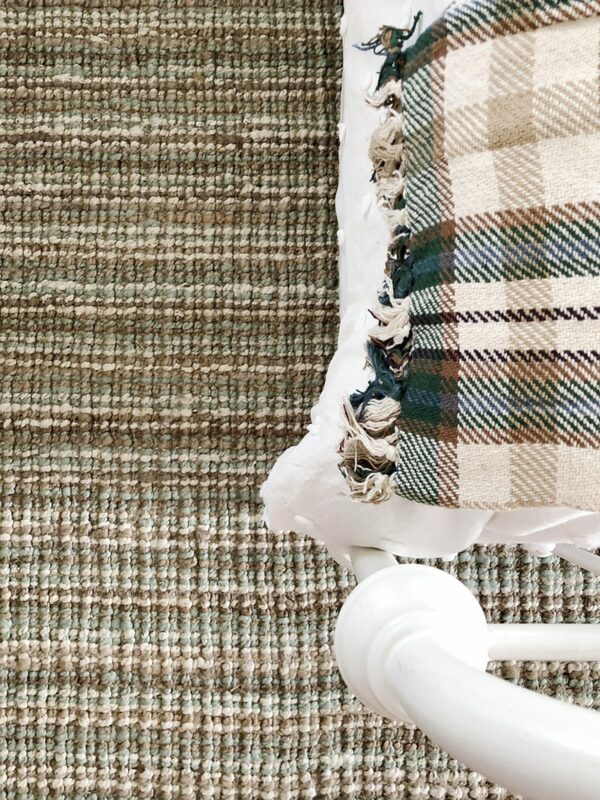 I am so in love with the texture and I love that it is different from all of the other rugs in our home! 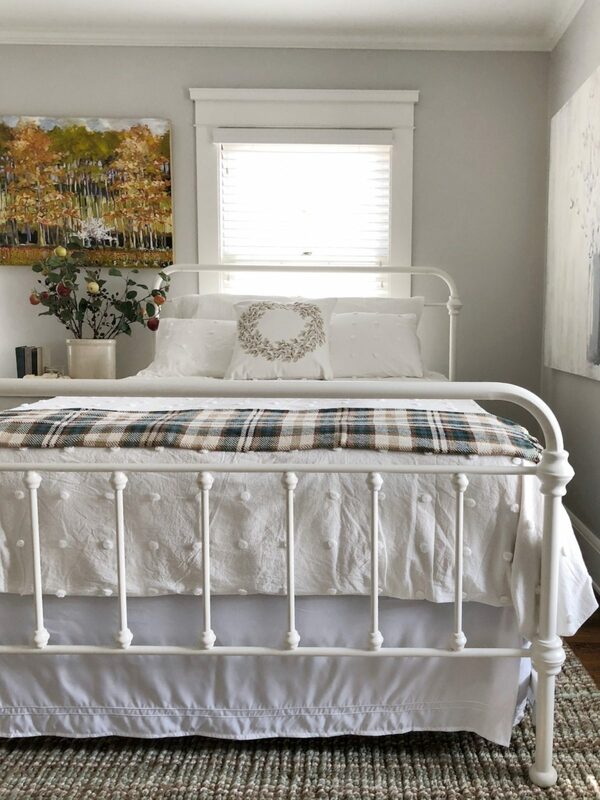 Plus, look how well it matches the Pagosa Plaid Woven Throw at the end of the bed. The polka dot bedding comes in a set and you will not believe how many things are included. Its the Maison Rouge Amelie Ivory Cotton Jacquard 7-piece Duvet Cover Set in the full/queen size. The polka dot duvet is adorable, plus it has six more pieces in the set! 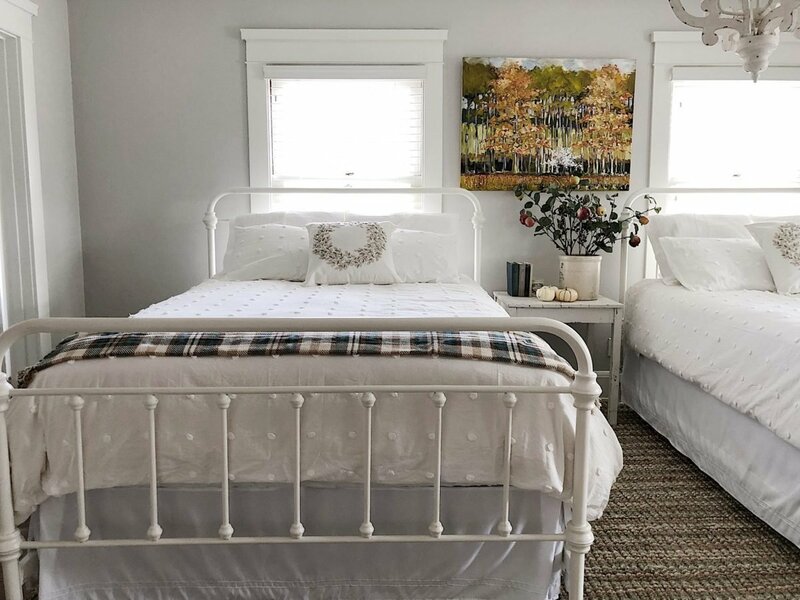 There are two quilted Euro shams, two polka dot pillow shams, and two decorative grey and white pillows (not pictured). I ordered fall pillows with felt cut wreaths which are the Rizzy Home Holiday Collection 20-inch Throw Pillows. They have a lot of designs available and I think they look great in this room! 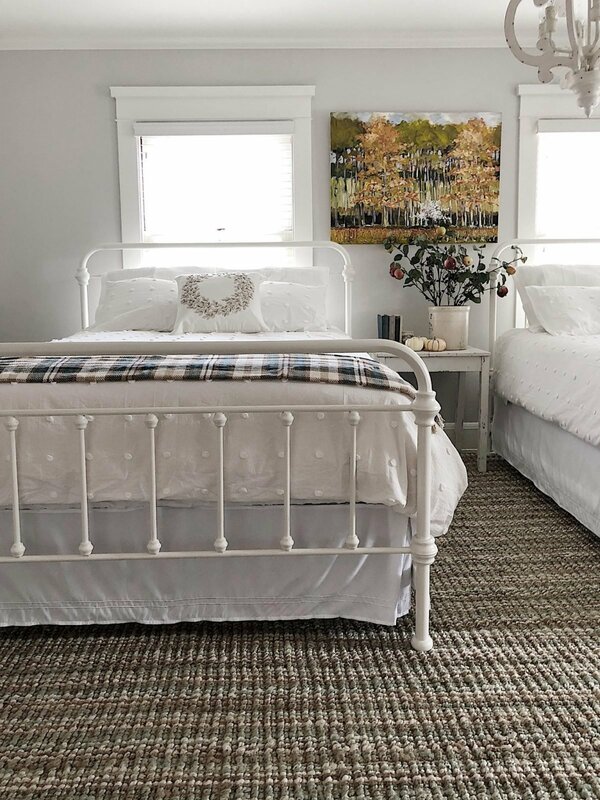 Finally, the bed skirts are the Baratta Stitch Embroidery 14-inch Drop Bed Skirt. I love the satin stitch! With all white bedding, I knew I was treading on thin ice with my boys. (They would likely think the room looks too feminine.) 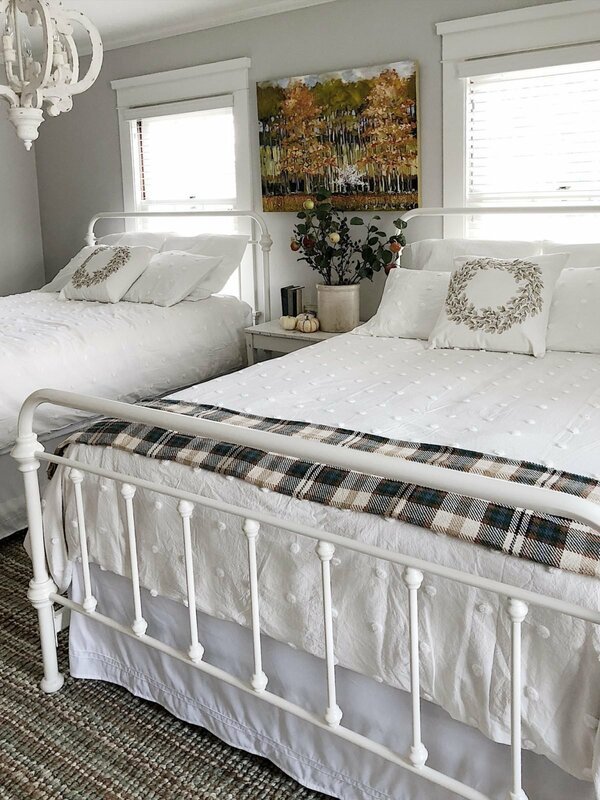 So I chose a more “masculine” Pagosa Plaid Woven Throw for each bed and I love the impact it has on the room. 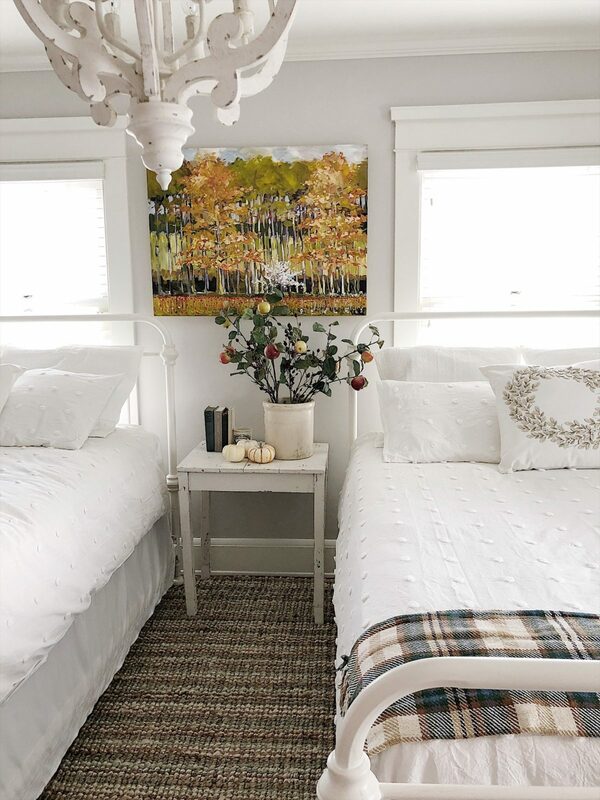 The rug and the plaid throws are perfect together. I thought I would share some of the progress photos of this room remodel. The best way to change a room dramatically is to start with an empty room. And that’s what I did. The rug was the first thing I put in the room. It took about a day for it to flatten entirely, as it was rolled pretty tightly in the bag. The beds took about two hours for me to assemble. It took an hour and a half for the first one and thirty minutes for the second one. 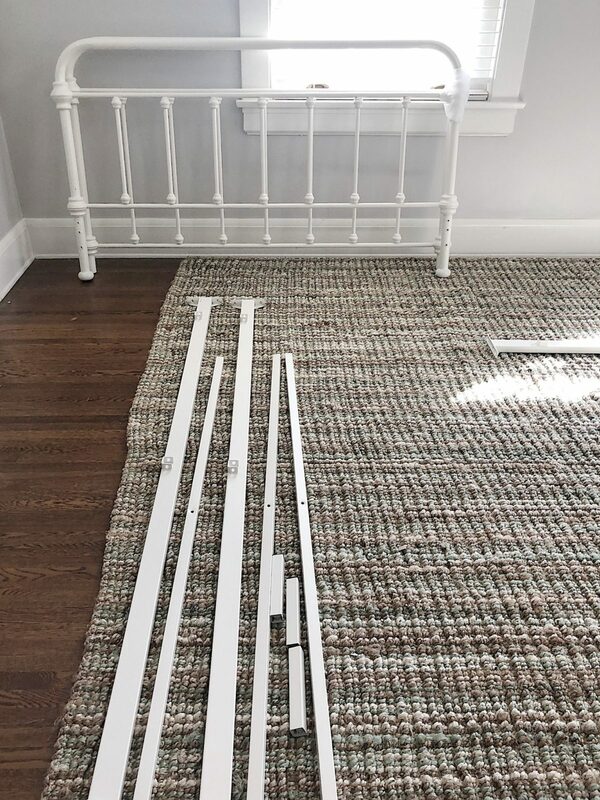 You can easily put these beds together with a helper to hold the headboards while you attach the sidebars. I was really happy with how sturdy the beds were once they were put together. I have no worries that my six foot five, six foot six and six foot seven boys will cause any damage to these beds. And since they are in their mid-twenties they have outgrown the jumping on the bed stage. The Sertapedic mattress bed sets are wonderful and really high. I remembered to add the bed skirt before the top mattress. I love when that happens! It’s a good thing I have a new steamer to iron my bed skirts! Here is a close up of the Duvet Cover Sets. 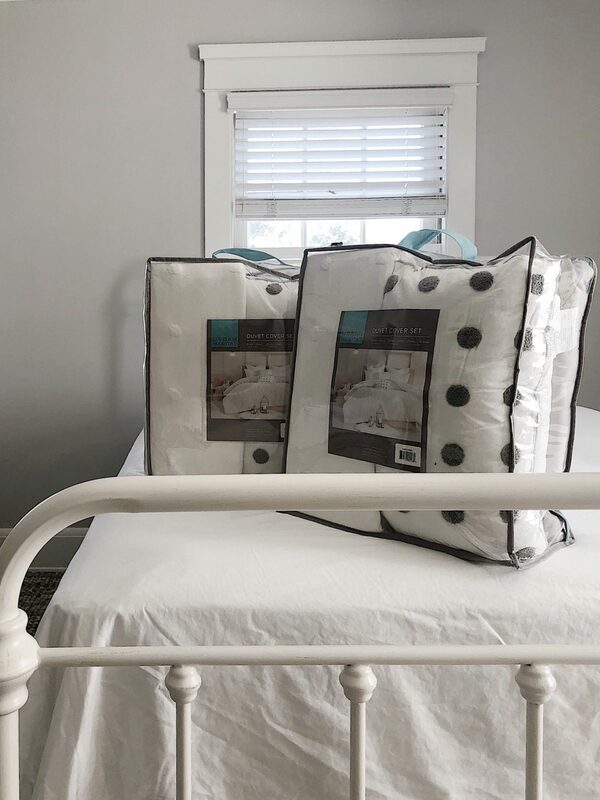 The white and grey polka dot pillow isn’t in my photos but I will use them. They are adorable. And here is the finished room. The painting, antique crock, florals, and vintage books are all part of my personal collection. I love shopping my home to add final touches. The table is also a vintage flea market find. I painted it with milk paint and I love it! I want to thank Overstock for making this room transformation possible. Be sure to head over to the Overstock site. They have just about anything you would ever need for your home. Looks wonderful. What a transformation. Clean and sweet. I am looking for a metal bed for our cabin in the mountains. Nice to hear the ones you purchased are sturdy. I will need to check out the color as I am looking for something darker for the cabin vibe.